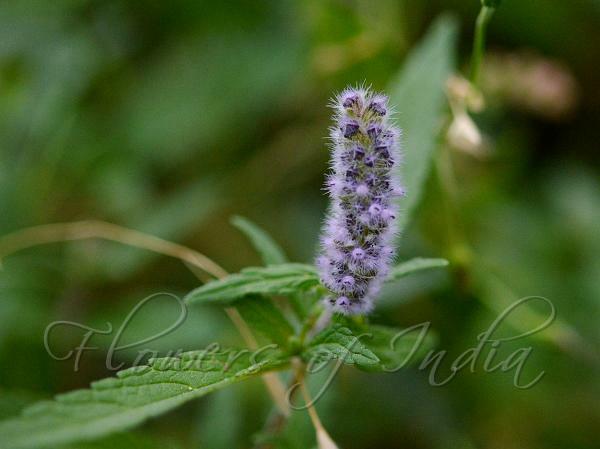 Dense Himalayan Mint is an annual herb, 10-50 cm tall, strongly aromatic. Flowers are borne at branch-ends and in leaf-axils, in upright spikes 3-5 x 0.5-1 cm with condense verticillasters. Bracts are broadly ovate, about 4 x 4 mm, green or purplish, hairy. Calyx is about 2 mm in flower expanding and inflating to about 5-6 mm in fruit and broad bell-shaped; teeth triangular densely hairy at margins, apically rounded. Flowers are pink or purplish, about 2.5-3 mm, very densely covered with purplish long multicellular hairs. Stamens remain inside or shortly protruding. Stems are simple or branched, quadrangular, often purplish, sparsely velvet-hairy with white multicellular eglandular hairs. Leaves are narrow to broad elliptic-oblong, 2-5 x 1-2 cm, regularly rounded toothed-minutely toothed, wedge-shaped, pointed, hairy on both surfaces, gland-dotted below. Leaf-stalk is 5 mm on lower leaves, less above. 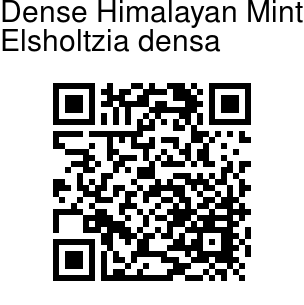 Dense Himalayan Mint is found in Afghanistan, C. Asia, Pakistan, in the Himalayas, from Kashmir to Bhutan, Tibet, China, at altitudes of 1000-4100 m. Flowering: June-August. Identification credit: J.M. Garg Photographed in Nubra Valley, Ladakh.